Posted on September 27, 2014 Author David	No Comments on Opportunity Costs: PA Or A Physician? 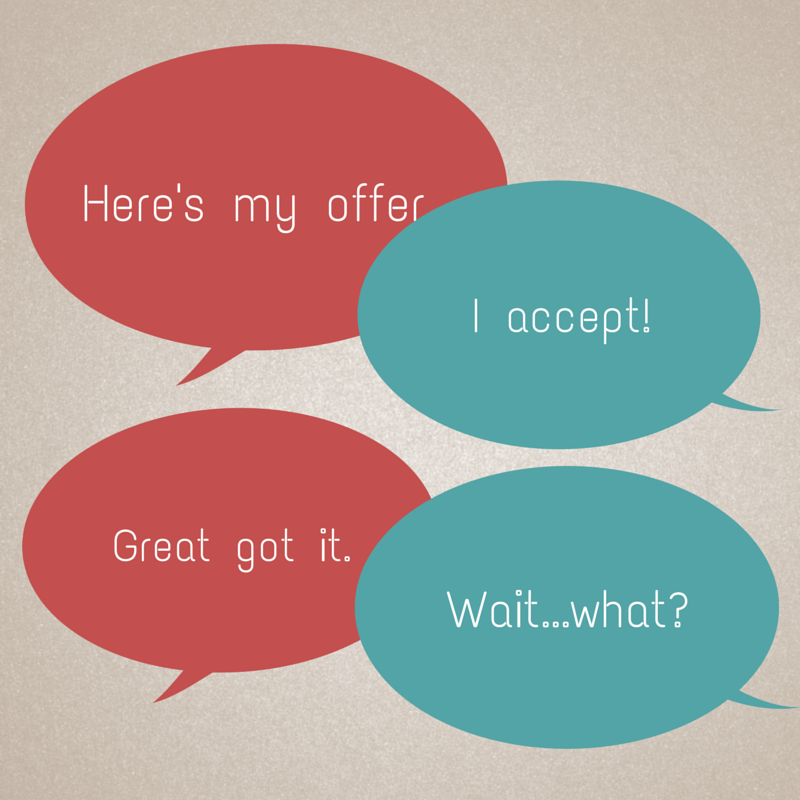 Opportunity Costs: PA Or A Physician? During my sophomore year of undergraduate school, I was required to take an economics course. Now, I don’t remember much from that class, but I do remember one particular concept: opportunity cost. It’s a simple idea really. Assuming the best choice is made, the opportunity cost is the lost benefit–it’s the benefit(s) you would have had if you chose the other option. For example, pretend you can only eat at one restaurant on one particular night. By choosing Restaurant A, you cannot have the food from Restaurant B. The cost of choosing A, then, includes missing out on the food from Restaurant B…which may or may not be better than the food at Restaurant A. Choosing PA School Over Medical School? Let’s apply this idea to choosing an occupation within the field of Medicine. Let’s say a student has been accepted to both medical school and a physician assistant program. Choosing to attend medical school means at least 7-10 years of formal didactic and clinical education. It means incurring extensive amounts of debt from student loans. There is also delayed gratification in buying a house, new car, or having a family. By choosing this route, your “cost” includes what the PA program/profession offers such as shorter training, less debt, and lateral mobility within the profession. Of course, choosing the PA route also has its own set of “costs”. Choosing PA means less autonomy, simpler cases, lower income, and initial limitations in medical knowledge. You may be a competent provider that works similarly to a physician but you will never be the expert. And, the truth is, one day you will be a twenty year veteran PA who will be supervised by a newly minted attending who is younger than your own children. Talk about a kick in the ego! A Call To Action: Tell Me What You Think! Why do I bring this up? It’s because I am currently in this position. If I had to choose right now, it would be medical school hands down. But if we examine the current climate of medicine as well as the future, the PA role may be a more economical and conservative one to embrace. As Medicine continues to grow as a multi-billion dollar business, there will be more impetus on hospitals and health care companies to lower costs. This puts the PA in prime position to move up the professional ladder and have continued employment opportunities across all specialties. That is not saying physicians will be without opportunity, as they will always have the top position in the medical hierarchy. (At least that’s how it looks right now.) But I can see their roles progressing to a more supervisory position over physician assistants who carry out a majority of the tasks. Perhaps, in a busy ED, you will see one or two physicians overseeing three to five physician assistants. Now this is all speculation…but I’m not alone in thinking this way. In Doctored: The Disillusionment of an American Physician, Sandeep Juhar (an interventional cardiologist) comments extensively on the state of Medicine in America and its depressing trend of moving away from doing what is best for the patient and more towards customer satisfaction. He illuminates studies done over the past decade that indicate a number of physicians regret their career choice at the present moment and would steer their children and those interested away from the field. Such a depressing thought. The opportunity costs riding on my decision really are very high no matter which direction I choose. I desire the autonomy and knowledge but at almost thirty years old, with ten years as a medic under my belt, the prospect of another decade of school is daunting. Throw in the overwhelming number of studies highlighting the unhappiness of American physicians in the 21st century and the conservation decision seems more and more clear. Still, potential regrets exist and the only thing I can do is attempt to minimize them. …so, what do you think? 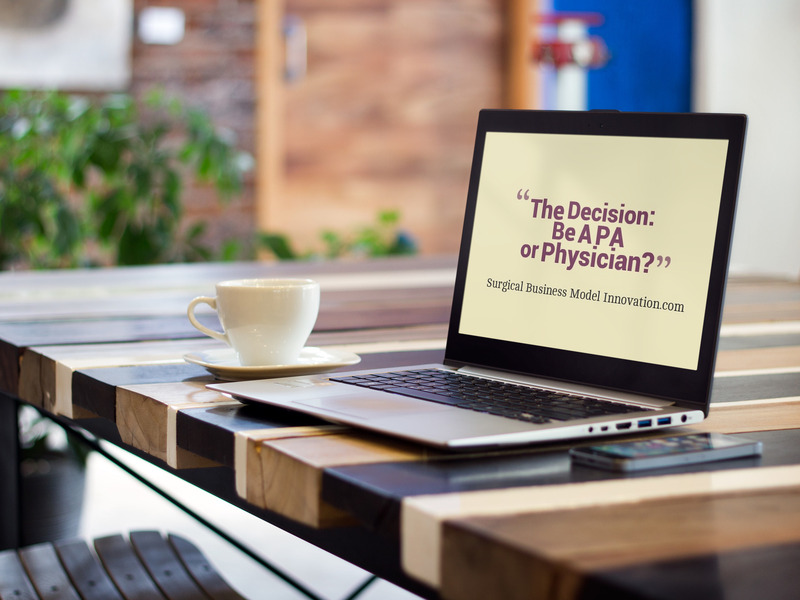 Are you a PA or physician? Let me know what you decided and why! Would you do the same nowadays? Keep The Gains You Made! Have you made any gains with your quality improvement project? If you made meaningful improvements, it is every bit as important to make sure those improvements are sustained. 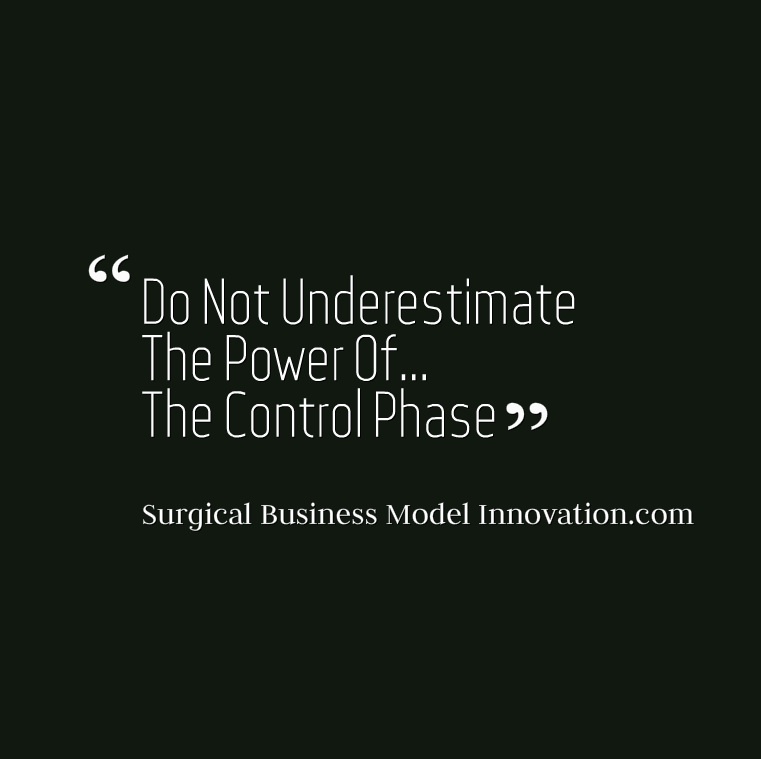 This is the last step in our quality improvement project: the Control Phase. The importance of the control phase is difficult to overstate. It is one thing to work through all the steps of the process and to make meaningful, measurable improvements. It is entirely another thing to be able to sustain those improvements as you continue to move ahead. Make sure that routine maintenance is performed so that you can sustain improvements and have something on which you can build the rest of your program or other processes. The control phase has several important toll gates as pictured here. One of the important steps of the control phase is to transition the project to the project owners. That means that after extended quality team has gathered around the table and measured data from the trenches, it is important to make it very clear in the control phase regarding who the process owners are. The process owners will be responsible on an ongoing basis for maintenance and reporting if there becomes an issue with the end points of the project. If, on repeated measurement at different intervals, there is a new issue with the process the process owners send out a signal that there is a problem and the end points need to be revisited. What Tool Should I Use For My Data? Just as important is the question of what tool to use for the control phase. There are multiple tools available for the control phase and here we will focus on one important tool that be easily utilized in healthcare. That is the ImR chart, where ImR means “individuals moving range” chart. The ImR chart is one of the multiple types of control charts that can be performed with your data. 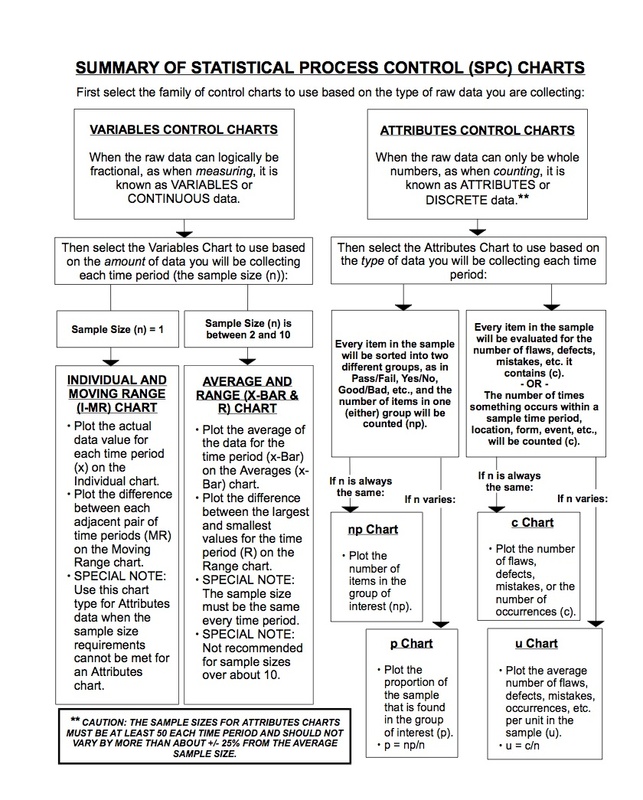 Please review Figure 1 regarding how to choose a control chart type for your data. In healthcare processes where individuals come through the system one at a time, the ImR chart works best. This chart demonstrates where individuals fall along a continuum over time. We will discuss some important highlights of the ImR chart now. CAUTION: There are some things the diagram above does NOT tell you. For example, did you know that control charts generally require normal data? In other words, if your data for a certain endpoint are non-normal, you cannot apply the straightforward, continuous data driven control charts that the diagram lists. If your continuous data are non-normal, that clean Figure 1 just doesn’t apply. For more information regarding how to determine whether your data are normally distributed look here. Ok, now you have established whether your data are normally distributed. If they are non-normal you will need to create a control chart based on non-normal data. We will delve into how to do this in another blog entry. For now, let’s just highlight how ImR and other control chart types are based on normal data. Why, Here’s An ImR Chart Now! Beneath please see a typical ImR chart (Figure 2). Notice that if you compressed all the data points to one end or the other of the control chart and remove the factor of time you would create a normal data plot. So, now to some definitions to let you know more about ImR charts and how to know whether your process is still in control or has gone out of control. Before we move on, look at the top plot in Figure 2. The green bar represents the mean/median/mode of these data. The red bars represent the 3 standard deviation mark beyond the mean. Any data beyond three standard deviations is considered to be MORE than the routine amount of variation expected in this system…and that makes sense. After all, the probability of a data point being more than 3 standard deviations beyond or beneath the mean in a normal data set is less than about 1%. So, data points outside the red bars make us ask: “What happened?” Setting the 3 standard deviation mark as what we use to identify outliers balances the risk of type 1 vs. type 2 error here. Note that identifying cases to review this way doesn’t mean anything was done wrong in those cases by any particular doctor or healthcare provider. We just have to ask how did the system produce such an outlier? For more info on type 1 vs. type 2 error, look here. 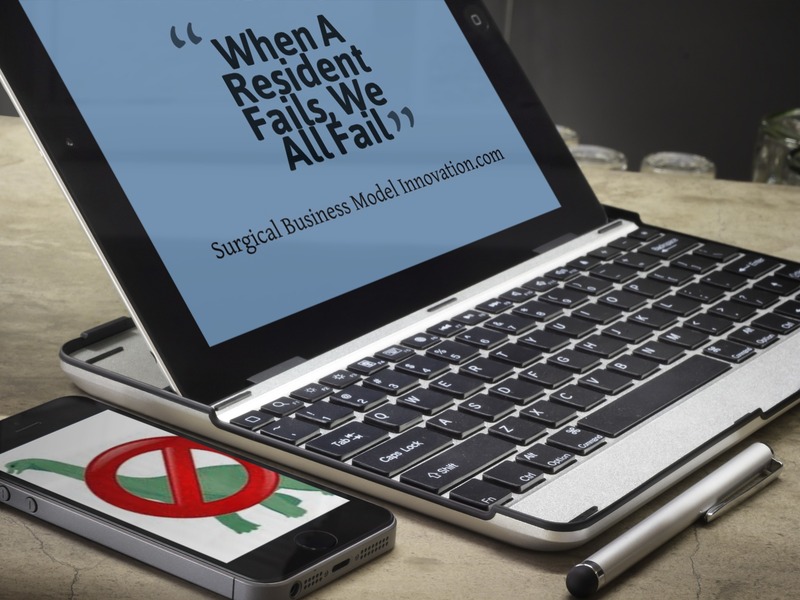 Now pretend that there was some requirement (perhaps made by your state) that trauma patients needed to be brought to the OR within 2 hours of arrival for severe abdominal injuries (if they need to go at all). What would you think about that top date in Figure 2? Maybe draw another line at 2 hours to represent that barrier. What do you notice? Well, PLENTY of points on the graph show patients as being brought to the OR outside of the 2 hour mark. Interesting! Those points at 2.5 hours, 2.7 hours, are completely “in control” from what we told you earlier YET THEY ARE COMPLETELY UNACCEPTABLE. Interesting, right? This tells you that your system is performing at its routine levels, and that routine level of performance is NO GOOD. 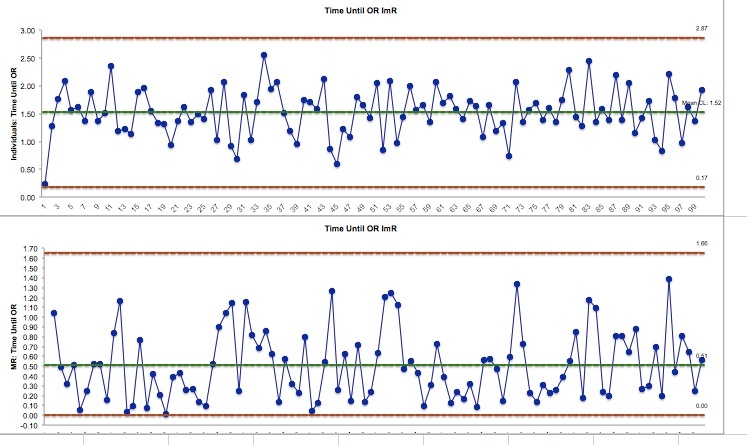 This is why we should NOT apply control charts until the end of a quality project: the control chart can tell us when the system is performing routinely yet lull us to sleep. It can tell us the system is performing routinely…yet that routine may be NO GOOD! 1. The most recent point plots outside one of the 3-sigma control limits. 2. Two of the three most recent points plot outside and on the same side as one of the 2-sigma control limits. 3. Four of the five most recent points plot outside and on the same side as one of the 1-sigma control limits. 4. Eight out of the last eight points plot on the same side of the center line, or target value. 5. Six points in a row increasing or decreasing. 6. Fifteen points in a row within one sigma. 7. Fourteen points in a row alternating direction. 8. Eight points in a row outside one sigma. However, let me tell you that not everyone exactly agrees with the Westinghouse Rules, and there are different rule sets out there. That one is pretty standard, however. One thing we all agree on: a point outside of the 3 sigma (3 standard deviation red bars) control limits is just not good. Look at those cases. At the end of the day the ImR chart is a very useful tool in healthcare for the control phase of the project. Remember, just as important as the particular tool is the fact that we engage in a control phase. The control phase helps us receive feedback from the system when something has gone wrong, something needs maintenance, and the “weeds need trimming”. There are many options for the particular tools you can use during the control phase for your project. Some are listed above. As usual the question of whether your data are normally distributed is central to being able to apply a control chart in a straightforward manner. Not only are there many types of control charts, but there are also some that do not require this focus on normal data and we will discuss these at another time. Best of luck with your quality improvement project. Please leave any thoughts or comments beneath!